View More In Safety Glasses - Page 3. Sperian A800 Series Eyewear - Protection that's easy on the eyes . . . and the pocket. The A800 Series is affordably priced and economical for your business while providing sporty styling and a fashionable fit for your everyday wearer. The temples have soft padded inserts with extra flex built in for more comfort and the soft nosepiece conforms to various nose bridge shapes for a non-slip fit. 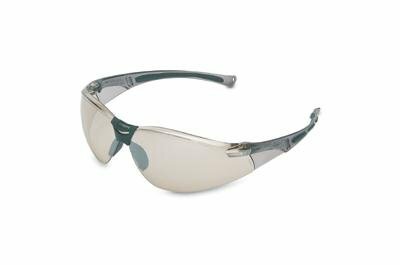 The 9-base polycarbonate hardcoated lenses provide a 180° field of distortion-free vision and blocks 99.9% of harmfule UV rays.